On Wednesday Fox News published an article about the United States Olympic team that took a surprisingly negative tone. And the author was no back-bencher on Fox’s roster. 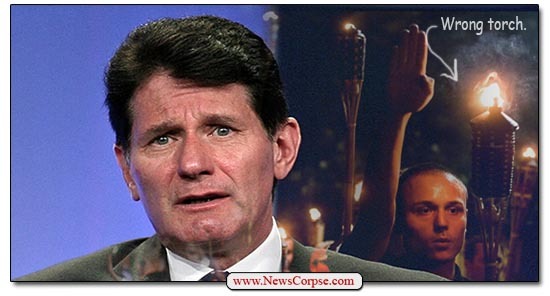 It was John Moody, the Executive Vice President and Executive Editor for Fox News. Apparently he was upset by reports that the U.S. athletes represented a broader scope of diversity than in the past. “Unless it’s changed overnight, the motto of the Olympics, since 1894, has been ‘Faster, Higher, Stronger.’ It appears the U.S. Olympic Committee would like to change that to ‘Darker, Gayer, Different.’ If your goal is to win medals, that won’t work. Not only was Moody flaunting his noxious hatefulness with the disparaging reference to being “Darker, Gayer, [and] Different,” he whined about the USOC official being proud of America’s team. And nowhere in the official’s comments did he suggest that anything but skill and talent would result in the award of medals. The entirety of Moody’s complaint was wrapped up in his personal biases. Really? The opinions of the Executive Vice President and Executive Editor for Fox News don’t reflect the views and values of the network? If Moody doesn’t reflect those values, than who does? He is literally the person who decides which views are aired on Fox News, and which aren’t. He tells his producers and hosts what to cover each day and how to frame the coverage. And if there is one thing that is unmistakable, it’s that his views in this matter are identical to everything you see on Fox News regarding American diversity. Just watch a few minutes of Tucker Carlson, or Sean Hannity, or Laura Ingraham, or Fox and Friends (if you can stomach it). For some background on Moody, last year he penned a column praising French presidential candidate, and leader of France’s neo-Nazis, Marine Le Pen. Moody even favorably associated Le Pen with Donald Trump. He called her “France’s Trump” and “the candidate closest to Trump in ideology.” And make no mistake, he considered that a compliment to both. So it’s impossible to separate him from the disgusting hate speech that he disgorged in his latest column. Even if Fox News deletes it. Moody is unalterably the personification of the network’s views and values, no matter how badly they might want to distance themselves from this.